Pink's Hot Dogs is a landmark hot dog restaurant in the Fairfax District of the city of Los Angeles on North La Brea Avenue across the street from the Hollywood district on the east. Pink's was founded by Paul and Betty Pink in 1939 as a pushcart near the corner of La Brea and Melrose. The Great Depression was still having an impact on the country, and money was scarce. People could purchase a chili dog made with Betty's own chili recipe accompanied by mustard and onions on a steamed bun for 10 cents each. As business grew, thanks to Betty's chili and the custom-made Hoffy-brand hot dogs with their natural casings, so did Pink's. The family built the current building in 1946 at 709 North La Brea Avenue in the Fairfax District in West Los Angeles across the street from the Hollywood district in Central Los Angeles. Pink's has named several newer menu items after Hollywood celebrities, some of whom can be seen at the restaurant. There are many signed celebrity photographs hanging on the walls inside; some celebrities have signed more than one photo. The celebrity-named hot dogs are often versions actually ordered by the person in question, such as the "Martha Stewart Dog" with mustard, relish, onions, chopped tomatoes, sauerkraut, bacon, and sour cream. Another is the "Rosie O'Donnell Long Island Dog", which is a 10" dog topped with mustard, onions, chili and sauerkraut. The "Huell Howser Dog" is a standard chili dog with two of the regular hot dogs on a single bun while the "Ozzy Spicy Dog" named for Ozzy Osbourne features a Polish sausage, nacho cheese, American cheese, grilled onions, guacamole and chopped tomatoes. A smaller selection of hamburgers are available, and desserts are a choice of coconut or marble cake. There is usually a long line of customers in front despite the lack of parking in the area. The often slow-moving line is viewed by some as part of the attraction at Pink's, especially on Friday and Saturday nights when the stand becomes packed with club and concert goers. Pink's has its own parking-lot attendant, even though parking is free. According to the menu, Pink's original signature chili dog in stretched, 10 in (25.4 cm) form remains the stand's top seller. During the Los Angeles Dodgers' World Series run in 2017, the restaurant changed its name to Blue's and repainted its pink and white facade for the first time in 78 years, making it blue and white and featuring Dodger logos and player names. They made a bet against Houston, Texas-based Good Dog restaurant in which the winning city would allow its customers to get free hot dogs the day after a championship win. Houston won. The Dodgers repeated as NLCS champs the next year, and once again named it Blue's, but lost the World Series to Boston. 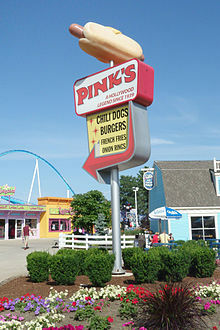 Pink's hot dogs are also sold at amusement parks--since 2011 at Cedar Point in Sandusky, Ohio, the first Pink's location east of Las Vegas, and since 2014 at Lake Compounce in Bristol, Connecticut. There are also locations inside LAX and The Forum. In June 2018, Brea Mall & Camarillo Premium Outlets opened theirs. Pink's is prominently referenced in the Harlan Ellison short story 'Prince Myshkin, and Hold the Relish'. Featured in the 1975 film Aloha, Bobby and Rose, in which the title characters eat at Pink's while on a date. Seen in John Cassavetes' 1971 film Minnie and Moskowitz; Moskowitz takes Minnie there after fighting off her date. The restaurant was one of Cassavetes' favorite spots in Los Angeles. The Michael Burger-hosted Personals also had Pink's in the bonus round, where couples won that if time ran out and didn't match the last question. In the 2009 novel Inherent Vice by Thomas Pynchon (set in 1970 Los Angeles) the main character, Doc, visits the restaurant. Featured in the eighth episode of 90210's second season, the characters Annie and Jasper are seen exiting the restaurant with their food. Featured in the 2010 Episode 2 of Korean reality TV series F(x)'s Koala (Hangul: f(x)의 코알라), in which the stars of the series, K-pop girl group f(x), paid a visit to this location to eat some foods, and offered their autographed photo. In Season 2 Episode 4 of Hell's Kitchen U.S., Gordon Ramsay takes the chefs to Pink's to show an example of organization within an extreme high volume restaurant. The opening credits of The Late Late Show with Craig Ferguson featured Craig Ferguson at the restaurant. Since new host James Corden took over the show in 2015, his title sequence also features him at the restaurant. The restaurant was used in an episode of Nathan for You, where host Nathan Fielder attempted to attract hurried customers by offering special circumstances that enabled patrons to cut in line. Pink’s restaurant was shown as destroyed by a meteorite toward the end of the 2009 movie Meteor Apocalypse. ^ Alejandro Benes, "Taking a Stand for Hot Dog Culture"
^ Markazi, Arash (1 November 2017). "Dodgers will be 'remembered forever' if they win championship". ESPN. Retrieved 1 November 2017. ^ "Sneak Peek: Pink's Hot Dogs at Shangri-La at the Fort, Bonifacio Global City". ^ Doherty, Michael. "DVD Review: Aloha, Bobby and Rose." popculturebeast.com, July 2014, accessed Mar. 16, 2015. ^ Ray Carney, Cassavetes on Cassavetes, London: Faber and Faber, 2001: p. 276. Wikimedia Commons has media related to Pink's Hot Dogs. This page was last edited on 20 March 2019, at 16:28 (UTC).